USA Hockey officially announced Friday that Team USA and Team Canada will play outdoors at Buffalo's New Era Field on Dec. 29, 2017 in the preliminary round of the 2018 World Junior Hockey Championship. Buffalo will be hosting the tournament, which will be seen live on TSN, from Dec. 26, 2017 to Jan. 5, 2018. 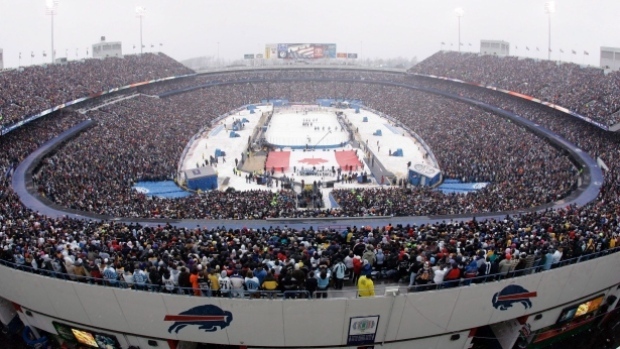 The game, played at the home of the NFL's Buffalo Bills, will be the first outdoor game held at any top-level IIHF world championship. "The U.S.-Canada rivalry is as good as it gets in sport," said Dave Ogrean, executive director of USA Hockey in a statement. "And to have an outdoor game between the two countries as part of the World Juniors in hockey-rich Western New York will be spectacular." The stadium also hosted the first-ever NHL Winter Classic on Jan. 1, 2008.